We headed east from the magical city of Paris, towards the border of the neighboring country on a train. 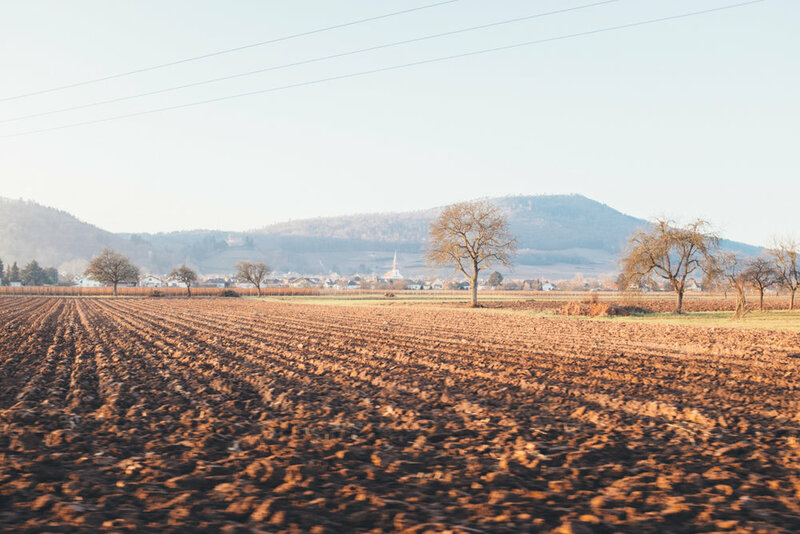 Giddy with excitement that our journey to explore the Alsace wine route - famously known for its vineyards and distinctive heritage - has finally begun, but our trip wasn't about wine. It was about Christmas Markets. We reached our destination in the middle of the night-pitch black but, happy to have finally arrived at the first stop of our Alsace adventure: Strasbourg, the capital of the Alsace region. 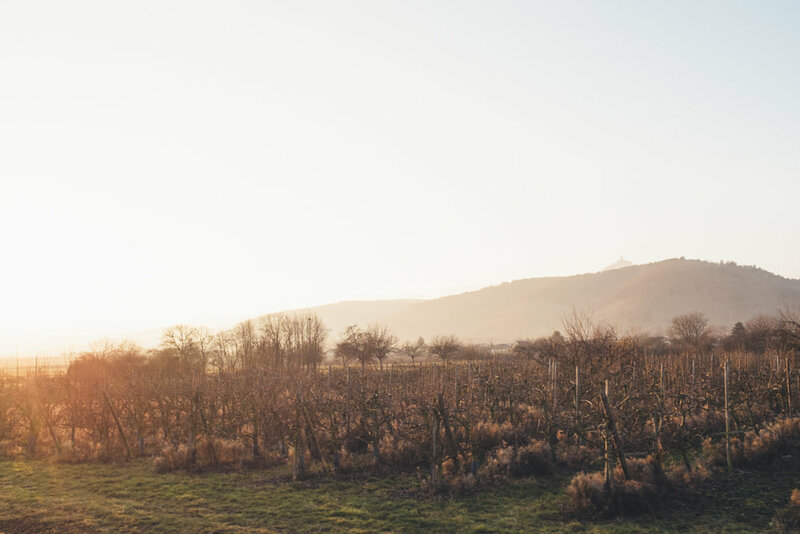 Culturally sandwiched between French and German, Alsace is neither German nor French, yet both play an important part in the region’s heritage. You can witness the cultural blend in the architecture, food, and traditions resulting in a very distinctive region from the rest of the country. Strasbourg, located in the northern part of the Alsace Wine Route, makes the perfect starting point. It’s also the biggest town in the region and the closes to Paris by train. We stayed 2 nights in Strasbourg to enjoy the magical Christmas markets. 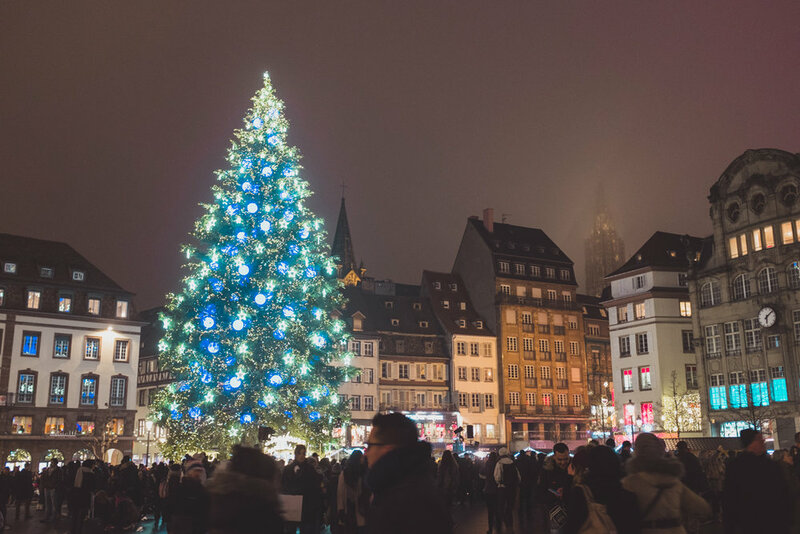 Year round, Strasbourg is an incredible place to visit – but during the holidays, this charming town turns into Christmas wonderland. 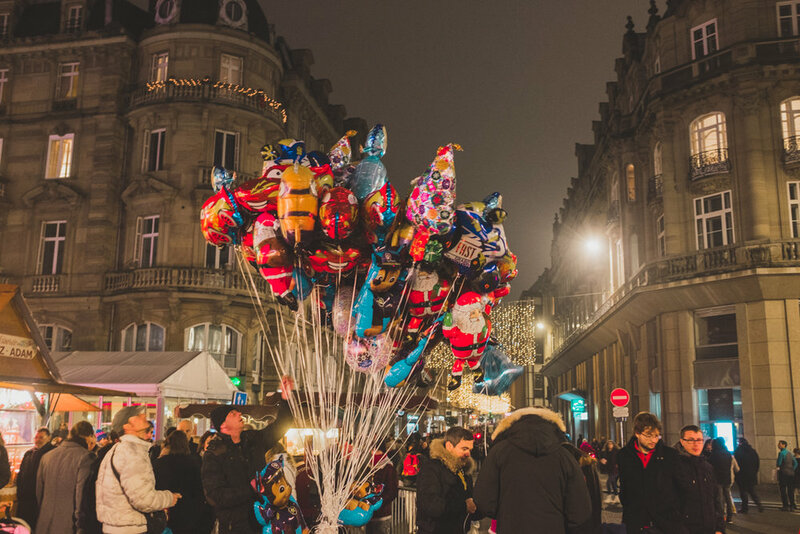 After all, the city’s motto is “Strasbourg, the capital of Christmas.” With over 10 Christmas Markets all around town, there's no shortage of markets for you to explore. 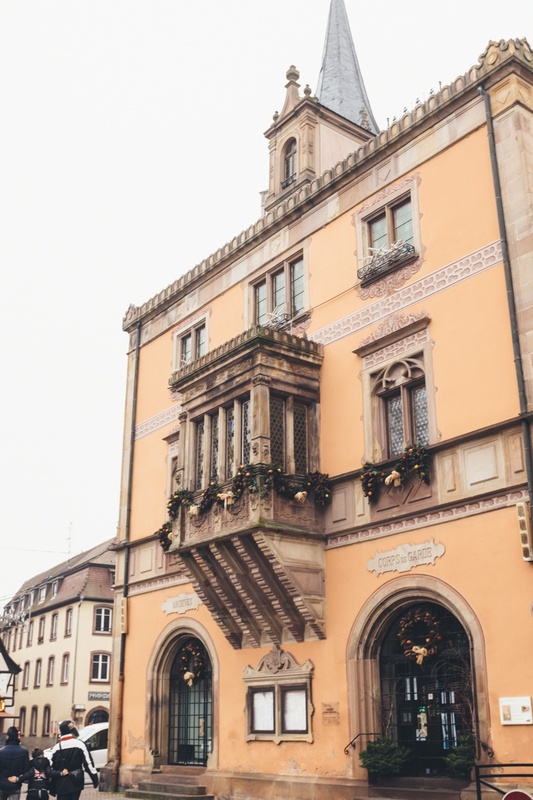 You can learn more about Strasbourg here. Ready to begin our road-trip on the Alsace route, we went to the car rental center and picked up our car - which is conveniently located next to Strasbourg’s train station. With hot breakfast in hand and playlist set, we embarked on our road-trip adventure and headed south on the A35. Our second stop on our Alsace road-trip: Obernai. This charming town is one of the best-preserved towns in the region. Its rich history, gastronomic reputation, and cultural events throughout the year attract countless visitors. After working an appetite on the road, we decided to have lunch at one of the quaint local restaurants. With our bellies satisfied, we visited a few shops for souvenir and got a few bottles of the local wine and sweet treats. Afterward, we visited the Christmas market for more goods. While December is a very popular season, I didn’t mind the crowd. The atmosphere felt very cheerful and the locals were very warm and friendly. The town is very small so, no need to spend an entire day here. I few hours or half a day will do and you can go on to your next destination. 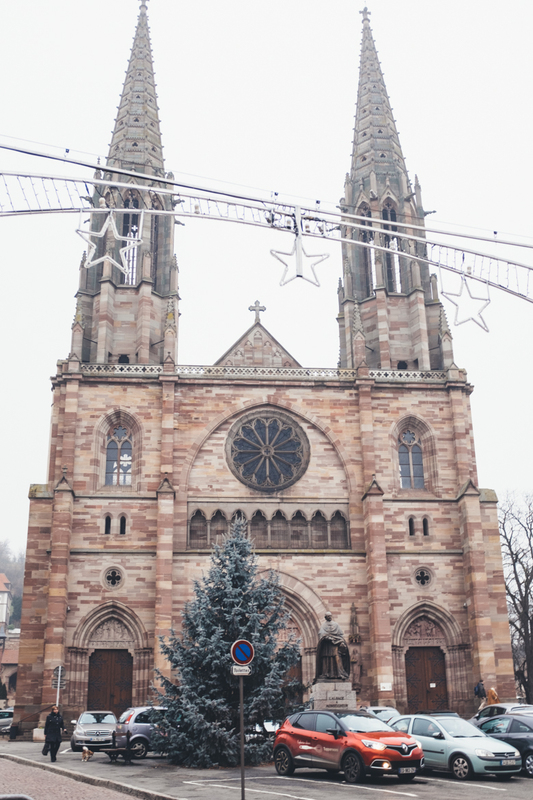 Although this may not be a Christmas Market, is a nice break from the crowd in the Alsace region. 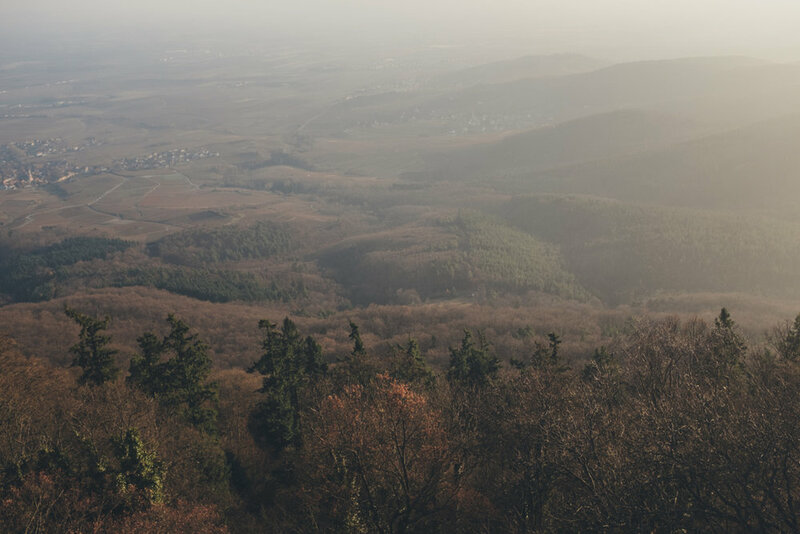 Just outside Strasbourg, Mont Sainte-Odile Abbey sits at the top of a hill enjoying an extraordinary view of the Alsace plain. If you are lucky, you will enjoy a breath-taking view at the monastery. Unlike us - when we arrived, the area was completely covered in heavy fog. Next Stop: Another great adition on your Alsace road-trip, the Château du Haut-Kœnigsbourg - One of France’s great medieval castles. Located at the top of a hill, the château has an incredible view overlooking the vineyards. Some people may say the best view is at the top but the drive up was equally beautiful! The medieval castle is a real treat for everyone - history buff or not. The Château du Haut-Kœnigsbourg is located just 34 miles south of Strasbourg. On the A35, take the exit 17 via Kintzheim, or exit 18 via Saint-Hippolyte. For more information about the château, check out their official website here. Our last stop: Colmar. We arrived late in the afternoon and settled right away in our hotel. The next morning, we headed to the Christmas market amid the colorful pastel buildings. To learn more about Colmar, keep reading here. Alsace cuisine is heavily influenced by Germany hence, dishes on the richer side with meat (pork) and potatoes. Nonetheless, Alsace food is a delicious mix of French and German cuisine. Tarte Au Fromage Blanc a thinly rolled bread dough covered with fromage blanc or crème fraîche, thinly sliced onions and lardons. Choucroute Garnie à l'Alsacienne - A local version of the sauerkraut. With heavy German influences, it's no surprise to see sauerkraut on a French menu. The typical dish consists of sauerkraut served with potatoes, sausages, and pork. The famous Alsatian dish is a must! Although December may not be the most picturesque time to visit the region, the scenery is still breathtaking. If you want to enjoy some greenery but still avoid the crowd, try April or September. If you are short of time, you could explore the area in just three days. But in order to soak-in everything that the region has to offer, spend at least five days. You may need the extra days to explore the smaller villages. Not a wine drinker? Don’t worry! The region has so much to offer that it’s still worth a trip. The wine is just a bonus. 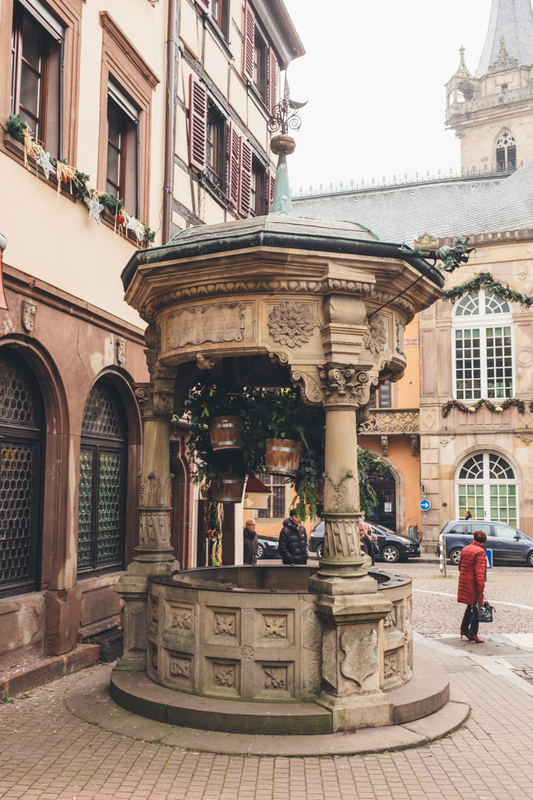 For more information on the Alsace region, check out their tourism’s website here. Check out my guide on how to pack for a winter vacation in Europe here. Pin it if you want to visit the Alsace wine route!